Ice on the LaPlatte River in February. These are the words of my great-grandfather, from a book he wrote ninety-three years ago called Man’s Spiritual Contact with the Landscape. I never met him, as he died long before I was born, but from his words I can tell that we have much in common. Every morning I walk beside the LaPlatte River in Shelburne and contemplate the life history of its waters. One morning this February a frozen flood made the magic in those waters visible. Rain on snow during a warm snap caused the level of the river to rise quickly during the night. By morning the river was several feet above its normal water level. The water fell gradually, but the temperature plunged quickly, and during the next night a thin layer of ice formed on the surface of the waters, marking the height of the water at the coldest part of the night. It was as though someone had pressed a pause button on the flood, and an eighth-inch-thick sheet of ice clung to trees and sticks, hovering six inches above the ground. 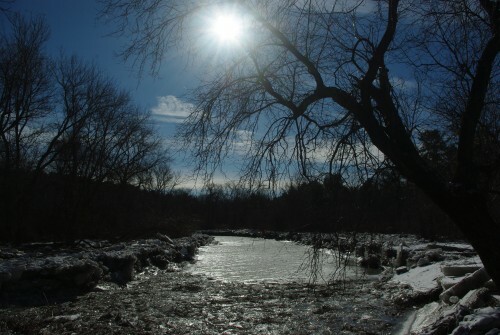 The frozen floodwaters of the LaPlatte River this past February. My dog and I crashed through this frozen landscape the next morning and reveled in the sparkling beauty of a world draped in a silver cloak of ice. Now, in April, the flood plain no longer sparkles, exactly – it wears the drab browns and greys of early spring. Bits of green poke through here and there, but for the most part every surface is still coated with the fine layer of silt left behind by receding flood waters. I revel in this landscape, too, because a functioning floodplain ecosystem is a beautiful thing. That thin layer of silt represents a fresh collection of nutrient-rich sediment for the hungry plants and trees of the flood plain. The plants of the flood plain are specially adapted to live in this water- and nutrient-rich environment, and they often depend on annual flooding not just for nutrients, but also to spread their seeds and carry away any less well-adapted competition. Different plants adapt to different environments of the flood plain, some preferring the naturally formed berms just beyond the banks of the river, while others are more suited to the slow-to-drain boggy back-swamps. These, too, depend on flooding for their formation. Marks created on a floating chunk of ice when it was carried beneath a tree overhanging the river. Roiling and fast moving flood waters contain a lot of energy, enough energy to carry much more than just silt. 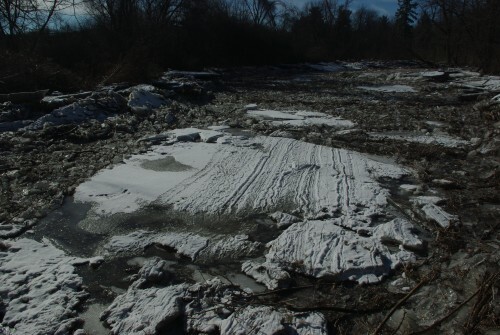 Sand, stones, and larger sediment often get swept up and transported long distances in a rushing spring river. When a river leaves its banks it immediately loses much of its energy. The water slows and spreads out across the floodplain, dropping first the heavy sediment, such as sands and gravel, and then the finer silts and organic materials further out. This sorting by size is what results in the gentle berms immediately past the banks of the river, and the silt that travels further is smaller, so it packs more tightly together when it reaches the ground, creating the slowly draining back-swamps beyond the berms. 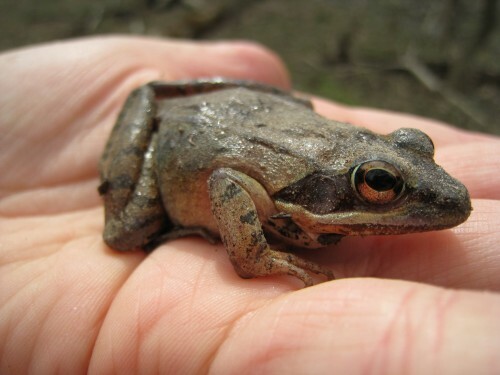 A wood frog found in April along the floodplain of the LaPlatte. Right now, in the pools of flood and melt water filling the back-swamps, peepers and wood frogs sing their spring chorus of lust in hopes of attracting a mate. These swamps and pools dry completely late in the year, and so sustain fewer aquatic predators that might eat the breeding amphibians or their eggs, so these pools are important for their survival. And their survival should be important to us, because amphibians are the main predators of mosquito larvae, who also favor the standing waters of back-swamps. 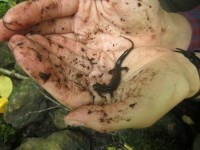 Another frequent inhabitant of back-swamps, eastern newts, are capable of eating over 300 mosquito larvae in one day. 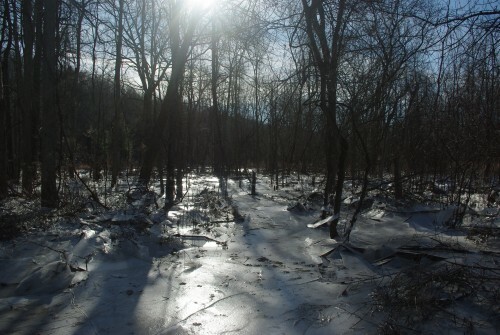 Many mammals also rely on the floodplain forests for their survival. Chipmunks and minks prey on the amphibians, and then in turn feed foxes, coyotes, and bobcats. Beavers are the architects of the channel, building dams and lodges that move the flow, eroding this bank or that, building sand bars with the changing flow path. Birds ranging from tiny wrens and finches all the way up to red-tailed hawks, ravens, and turkey vultures also feed on the life that surrounds the river. My grandfather’s book included a chapter for each month of the year, but he began with the running waters of April. As I walk beside the river each morning it is not so difficult to see why, for the river and its tributaries are like veins through the landscape: they carry life. Life that wakes and grows and flies and sings in April. So next time you find yourself beside a river in April, look beyond the dull grey patina of silt and enjoy the magic that is running water. 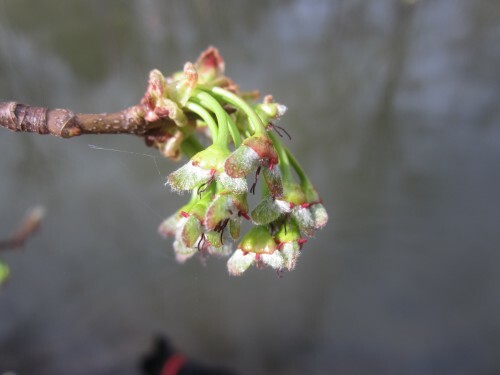 Silver maple flowers developing into seeds beside the LaPlatte River. Silver maple is a common floodplain tree species. 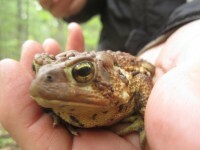 Shelby Perry is a second year student in the Field Naturalist program. Her great-grandfather, Stephen F. Hamblin, was the author of the book Man’s Spiritual Contact with the Landscape and co-author of Handbook of Wild Flower Cultivation. He was a professor of horticulture and landscape architecture at Harvard University and the Rhode Island School of Design and founded the Lexington Botanic Garden. Here’s the good news: the stigmata mummy-wasp didn’t make the monster list for having a painful sting. In fact, these wasps are small and don’t have stingers. In place of a stinger on their hind end, these wasps sport an ovipositor, which they use to inject their eggs under the skin of an innocent and unsuspecting host caterpillar. 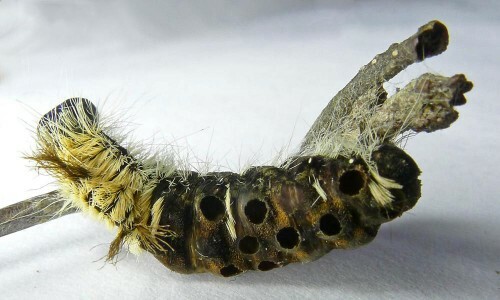 After the eggs hatch the wasp larvae chew a hole in the underside of the caterpillar, causing it to leak fluids that dry and essentially glue the caterpillar to a plant. Next the larvae mummify the caterpillar by eating the soft innards and lining the empty body with silk. Inside the hollow caterpillar husk the wasp larvae spin their own cocoons and pupate into adults. When they emerge from their cocoons they chew their way out, leaving behind the dry husk of a caterpillar that looks like it has been sprayed with buckshot. Even though this may sound straight out of science fiction, stigmata mummy-wasps are native to Vermont where they generally inhabit wetlands and floodplains. Though the wasps themselves are small and hard to find, the mummified caterpillars are not. Their riddled mummies can be found clinging to sticks year round, and if you find one in late fall you might want to watch it closely – you might be lucky enough to spot one of these little monsters emerging. There are many types of aphids, but while I was researching for this list one variety stood out: Oleander aphids. These little orange and black bugs grab onto a stalk of milkweed (or any of several other plant hosts) with specialized sucking mouthparts and drink it dry. Their story only gets weirder from there. Oleander aphids develop from unfertilized embryos and all adults are female; males do not occur in nature. Adult females can be winged or wingless, the former usually showing up when the host plant is overcrowded or dying so that they can fly off to infest a new host. Both the winged and wingless adults excrete live nymphs instead of eggs, and a colony can grow quickly. The nymphs develop through five different phases before becoming adults, but nearly all phases look the same and vary only in size. 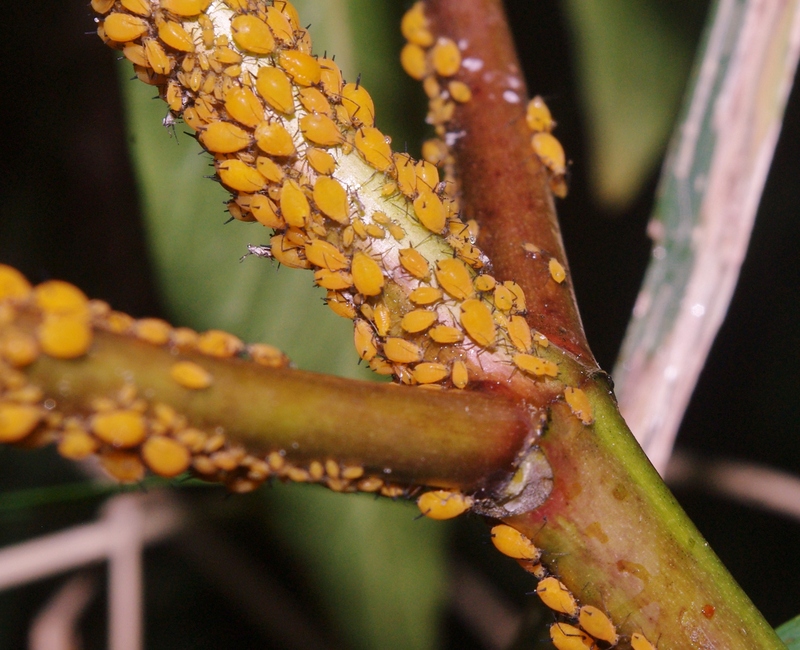 If an army of jack-o-lantern colored female clones sucking the life out of a plant isn’t Halloween enough for you, I should also point out that oleander aphids have their own mummifying parasitoid wasp. The aphidiid wasp (Lysiphlebus testaceipes) lays a single egg inside an aphid nymph or adult. When the egg hatches the wasp larva consumes the aphid from the inside, so that it develops into a brown papery husk of its former self. Much like stigmata mummy-wasp larvae, the wasp larva then spins a cocoon inside this mummified aphid, pupates, and chews its way out, leaving behind a bloated brown aphid mummy with a hole in it. When a dense colony of oleander aphids is heavily parasitized, half or more of the aphids in the colony may eventually be only mummified remains while their sisters slurp placidly beside them. How bewitching. 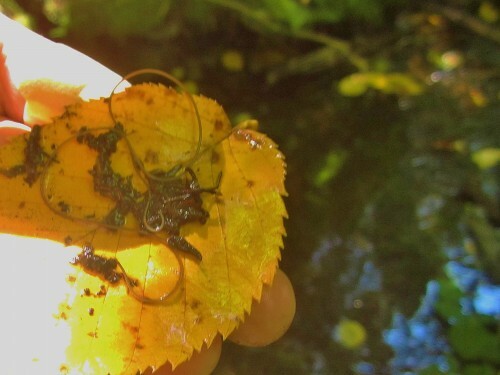 Resembling an animated, wiry strand of hair, horsehair worms are often spotted writhing in the bottom of woodland streams and pools. As charming as that may sound, their mating behavior is less than romantic. When a female indicates a willingness to mate, the male releases a cloud of sperm in her general vicinity, and then swiftly dies. The sperm forms a glob, which finds its way to the appropriate receptacle on the female within the next 24 hours. A fertilized female goes on to lay as many as 6 million eggs, and then she too perishes. As It turns out this is the least offensive part of their life cycle. The eggs mature, and in 2-3 weeks millions of tiny worm larvae are hunting for hosts in the pool or brook. They infect many different kinds of aquatic phase insects, including mosquito larvae, and when the infected larva matures into its adult phase, the worm larva comes along for the ride. Eventually this intermediate host insect is consumed by the host the worm is really looking for: crickets and their relatives. Once inside this final host the worm begins to absorb nutrients through its skin from the host’s body. Having no mouth or digestive system of its own, the worm requires an environment where food comes pre-digested. While growing inside its host, a process that takes 2-3 months, the worm is also practicing mind-control. An infected cricket will not chirp at all as chirping uses up precious energy and can attract unwanted attention to the worm’s comfortable home. Once the horsehair worm has fully developed inside of its cricket host (reaching lengths of four inches or more), it releases a chemical that drives the host to seek out water. Meanwhile the worm has carved a hole in its host’s side, and shortly after the host hits the water the worm will emerge in its free swimming adult phase to mate, leaving its injured but still living host behind to begin the cycle again. From the mummified remains of caterpillars, to the mind games of a parasitic worm, our Vermont backyards boast a roster of Halloween monsters rivaling those of the silver screen. So this Halloween, when you find yourself telling scary stories with friends, borrow a tale right from your own backyard…and sustainably source your monsters. 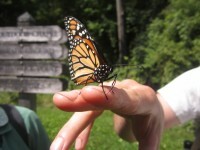 Shelby Perry is a second year student in the Field Naturalist Program. She would like to acknowledge Field Naturalist Graduate, Charley Eiseman, for his help fact-checking sections of this post, and his wonderful book Tracks and Sign of Insects and other Invertebrates: A Guide to North American Species. 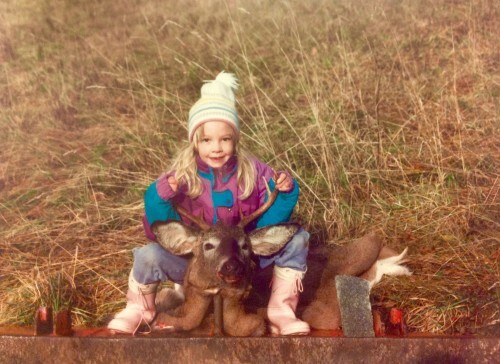 Shelby and one of her dad’s bucks sometime in the early 90’s. It’s hunting season, and this year I’m working through my end-of-semester stress with a rifle. I’ve never been a hunter before, but, as a native Vermonter, deer camp, hunter-safety orange, and the first rule of gun safety (always point your muzzle in a safe direction!) have been in my vocabulary since childhood. As I prepare for my first rifle season as a hunter, I have been surprised to find that many of my classmates did not grow up around hunting, and haven’t really thought about what it might mean to them. Staying safe during hunting season really boils down to three main points, and shouldn’t be intimidating or frightening. Be visible. Wearing hunter-safety orange any and every time you go out in the woods during rifle season is a must. A lot of people think wearing any bright color will do, but almost nothing is more visible and recognizable as human in the late fall forest than hunter-safety orange. Be respectful. Few things are more frustrating for a hunter who has been shivering silently in a tree stand since dawn than a person or dog thrashing obliviously past. If you think there might be a hunter already in the woods it’s best to stick to heavily traveled trails or to just avoid the area during rifle season altogether. Less about safety and more about etiquette, respecting other legal uses of the forests you love is a condition on which your own access depends. Take it seriously. “It won’t happen to me” is the wrong approach to safety during hunting season. Spend 8 hours looking for deer in the woods and your brain will start to make them out of everything – tree branches are antlers, the crunching leaves under a retreating rabbit are footsteps. I am not condoning the actions of anyone who would pull the trigger before being absolutely certain of their target, but I am saying that it is wise to set yourself up for success. Never assume your safety is someone else’s responsibility. I was afraid that this year, like so many others, I would lose track of time. I was afraid I’d spend all of the fall foliage season behind a computer or buried in a book. I was afraid that in grad school I would have too much homework to do to be able to spend much time outside. But I promised myself: this year I’ll make time. 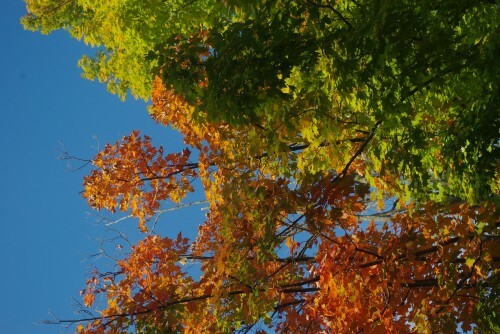 This year I won’t let the seasons change without admiring the gradient between them. This year will be different. As it turns out I needn’t have worried. This year everything is different. In the Field Naturalist program the brilliantly colored trees form the walls of my classroom, the shimmering late summer sky its ceiling. We bask in the changing seasons, taking advantage of days warm enough to slog barefoot through a bog and roll up our pants to wade in the cool lake. 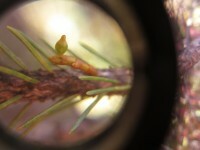 We catch salamanders, admire worm holes, and request the name of every plant we come across. Oh, and everywhere we go we dig a hole. Our days meander beautifully through each place we go, carefully choreographed to tell a story. We learn how bedrock affects plant communities, how soils here are different from those in the tropics, and how deep the peat is in Chickering Bog (23 feet!). This kind of learning is new to me; learning in which we immerse ourselves in our subject matter completely. I go home each night somehow exhausted and energized at the same time, filling my notebooks with lists of things to investigate further. As I promised myself, I do make time to go out and enjoy the changing of the seasons outside of class. I take long rambling walks through the woods with my dog every morning and some evenings. The only difference is that now I get to justify it as studying. 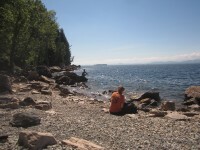 Shelby is a first year graduate student in the Field Naturalist program. 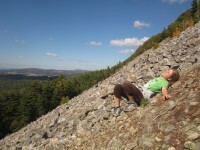 She enjoys catching toads and salamanders, admiring bugs, climbing talus, and all other explorations of nature.